This three-in-one holiday gift set is the perfect gift for any baseball fan this season. Each with its own unique story, these books will thrill any fan of America’s favorite pastime. 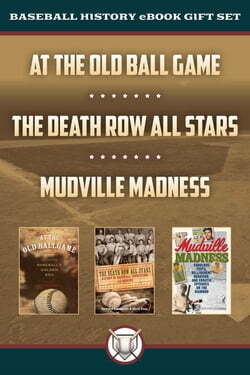 The set includes class tales (At the Old Ballgame: Stories From Baseball's Golden Era), scandals (Mudville... read more Madness: Fabulous Feats, Belligerent Behavior, and Erratic Episodes on the Diamond), and a unique portrait of baseball’s early days (Death Row All Stars: A Story of Baseball, Corruption, and Murder). That’s three strikes for this set!